Recombinant fragment corresponding to Human GFPT1 aa 525-681 (C terminal). (BC045641). WB: HeLa and Human kidney lysates. IHC-P: Human fetal testis tissue. Lyophilised:Reconstitute in 200ul Sterile Distilled Water. Our Abpromise guarantee covers the use of ab176775 in the following tested applications. WB 1/200 - 1/1000. Predicted molecular weight: 77 kDa. Nucleotide-sugar biosynthesis; UDP-N-acetyl-alpha-D-glucosamine biosynthesis; alpha-D-glucosamine 6-phosphate from D-fructose 6-phosphate: step 1/1. Defects in GFPT1 are the cause of limb-girdle myasthenia with tubular aggregates (LGMTA) [MIM:610542]. A congenital myasthenic syndrome characterized by onset of proximal muscle weakness in the first decade. Individuals with this condition have a recognizable pattern of weakness of shoulder and pelvic girdle muscles, and sparing of ocular or facial muscles. EMG classically shows a decremental response to repeated nerve stimulation, a sign of neuromuscular junction dysfunction. Affected individuals show a favorable response to acetylcholinesterase (AChE) inhibitors. Contains 1 glutamine amidotransferase type-2 domain. 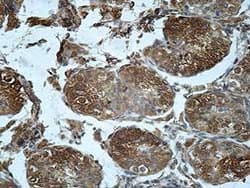 Immunohistochemical analysis of formalin-fixed, paraffin-embedded Human fetal testis tissue labeling GFPT1 with ab176775 at 1/100 dilution. Publishing research using ab176775? Please let us know so that we can cite the reference in this datasheet. There are currently no Customer reviews or Questions for ab176775.